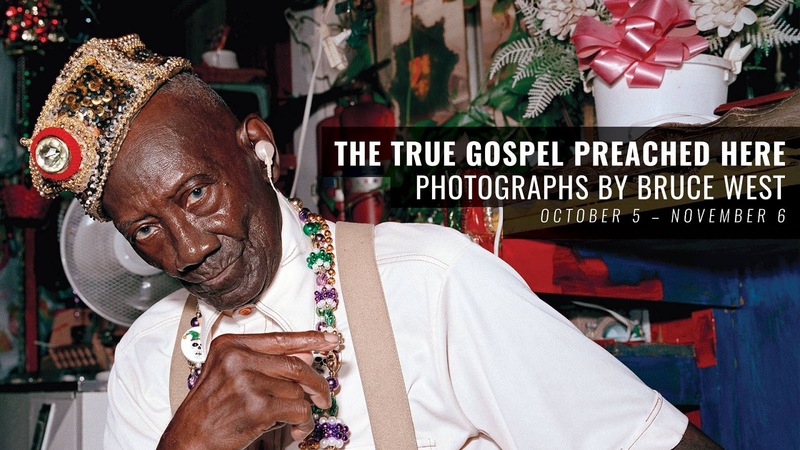 Missouri-based photographer Bruce West will speak about his work in the galleries and will be signing copies of his book "The True Gospel Preached Here" (2014, University Press of Mississippi) afterwards. Books will be available for purchase. Gallery talk and book signing will go from 5 to 6:30 PM (the galleries will remain open for reception until 8 PM). This event will also serve as a closing reception for the exhibitions "The True Gospel Preached Here: Photographs by Bruce West" and "Memphis Collects Contemporary Folk Art," on view at The Martha and Robert Fogelman Galleries of Contemporary Art from October 5 to November 6. Photo: Bruce West, Reverend H.D. Dennis Sits in Judgment (detail), 2003. Archival inkjet print. Courtesy of the artist.